It’s nice to freshen things up once in awhile… fluff and plump and dust, simplify and rearrange. With that in mind, I recently challenged myself to give my website a complete overhaul. The old site served me well, and I was proud of myself for rolling up my sleeves and learning how to code html, but the internet has come so far just in the last 12 years that it was time to change to something simpler. It took awhile, but now it’s all done! 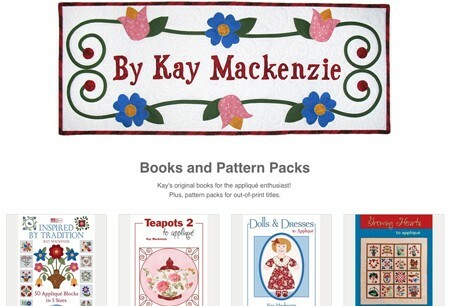 The By Kay Mackenzie shop is now powered by Square. It’s much easier to navigate, and you can see everything for one item all together in one spot! That’s worth celebrating! Celebrate the grand reopening with a coupon worth 10% off your entire order! Enter FRESH as a promo code during checkout. Normal shipping charges apply. Expires May 31, 2016. Note: The url for my website stays the same. You’ll land on the home page, and from there you can click “Come on in the shop” and you’ll go to the new Square online store. 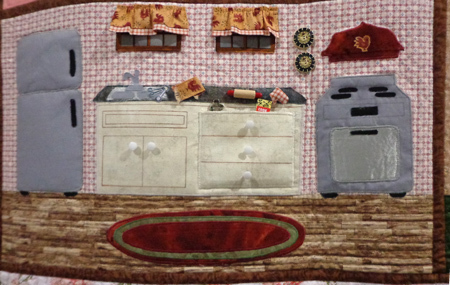 In Sonora over the weekend, Susan Florez mentioned to me that she had a dollhouse quilt in the show. I went to take a look, and OMG! What a dollhouse wonderland! It’s the kind of quilt where you just stand there and look at every square inch of it, discovering delightful details at every turn. The sweet girly bedroom. Wish mine looked like that. I loved this little domestic microcosm. Here are links to the information on the label. Designed by Jan Leifson for The Apron Lady Designs and purchased at Bearly Quilting (in Sonora). What lucky kids!! Congratulations, Susan, on a true heirloom. 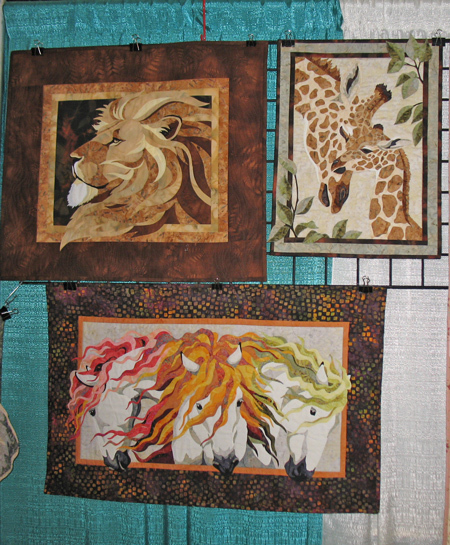 This weekend, I’ll be in Brentwood (the one in northern California, not the one near UCLA) for the Delta Quilters show. Back one day, then headed to Palm Springs for the brand-new Quiltfest Oasis, put on by the same folks as PIQF. We are returned from our anniversary trip to the Big Island. Wherever we’ve gone in Hawaii we’ve loved the climate, culture, and natural beauty, and this trip was no exception. 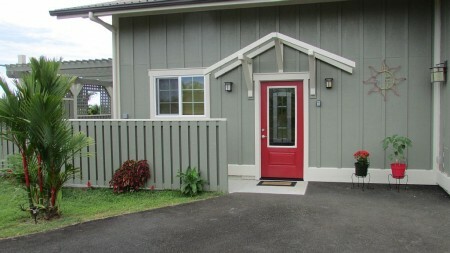 We stayed in a vacation cottage about 10 miles north of Hilo. It was just about paradise, so calm, quiet, and peaceful. Below us was a spreading fruit orchard. 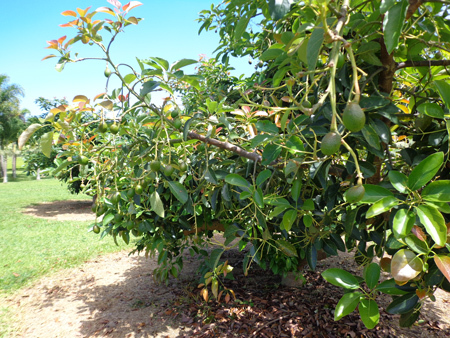 Avocado tree with baby-size avocadoes. All around us were grazing horses, cows, and goats. 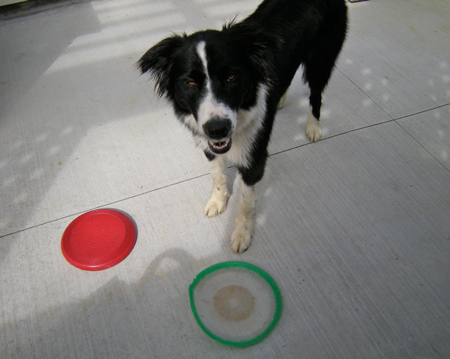 BUT, for us, being the dog people that we are, one of the very best features was the frisbee-loving, sweet, affectionate, huggy border collie Lilly! The green one is her favorite. 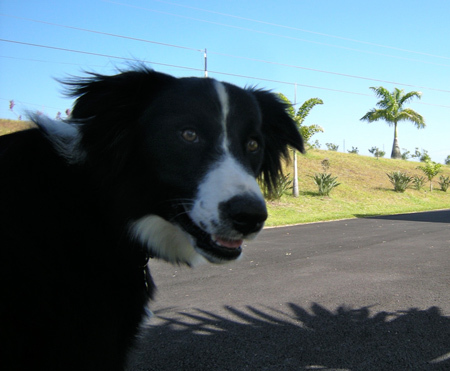 Lilly came to greet us, give us hugs and kisses, and hang out with us throughout our stay. 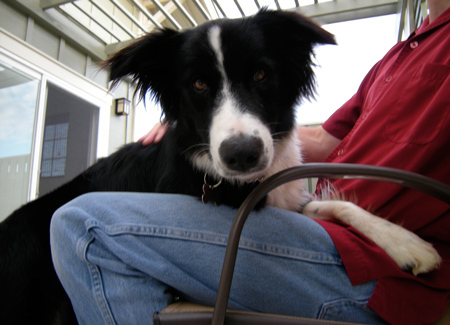 Dog love = bonus! 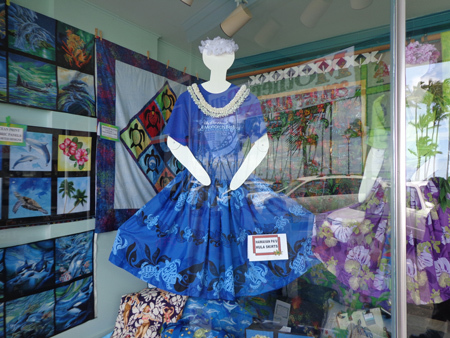 As soon as we went into Hilo town, I sought out the quilt shop, Fabric Impressions. Beautiful pa'u skirts in the window. 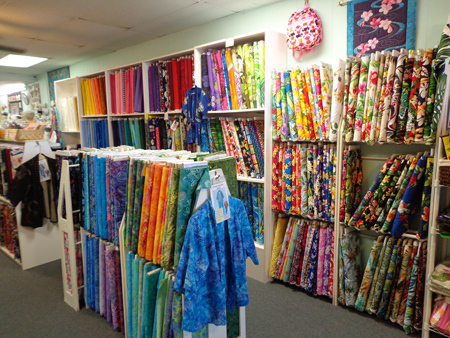 Inside were luscious batiks, island prints, Hawaiian patterns, kits, and quilts hung everywhere. 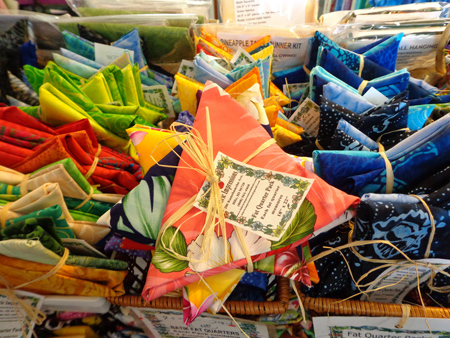 Dana liked the way they packaged their fat quarters… like stars! 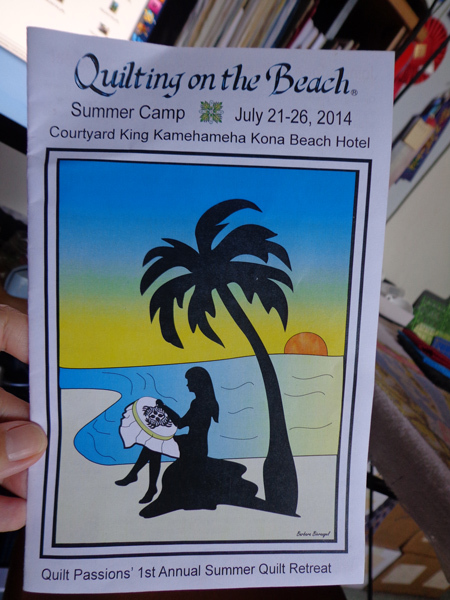 I picked up a brochure for an upcoming summer camp, Quilting on the Beach. Oooh!!! It’s July 21-26 at the King Kamehaha Kona Beach Hotel. I can’t make it, but maybe you can! 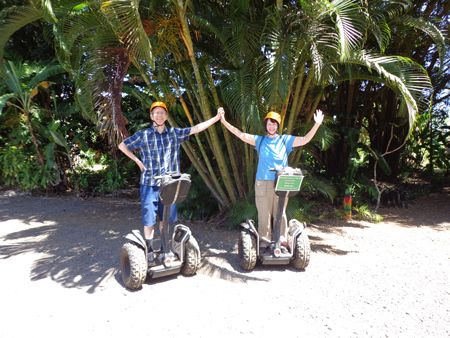 One morning we signed up for a Segway tour at Botanical World Gardens. I had always wanted to ride a Segway, and this was my chance! OMG, I loved it! Our instructor told me I was a natural and I really did feel as though I took to it like a duck to water. It all depends on where you put your weight, and once you get the hang of it, it’s like you just think what you want to do and it does it. Very cool! 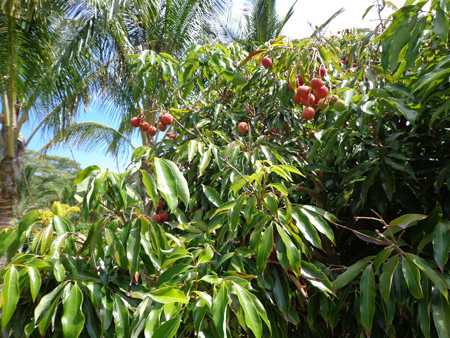 We toured the gardens and were given tastes of many fruits picked fresh off the trees. There was one that tasted like brown sugar, yum, one that was supposedly like chocolate pudding, not so sure about that one, and several that were too tart for me but that Dana liked. We zipped here and zipped there, learning about various plants and trees. 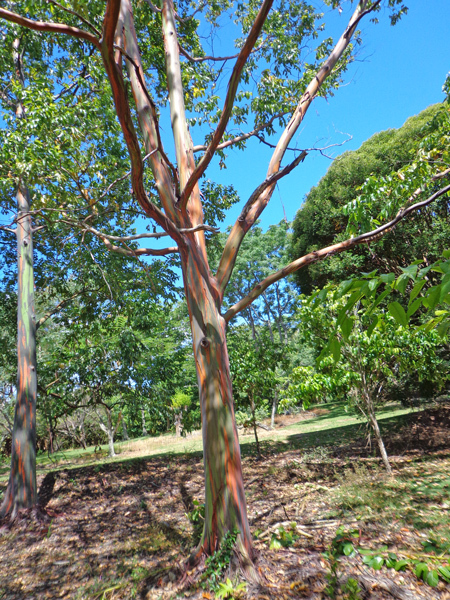 We saw a rainbow eucalyptus, amazing! Dana did very well also, but he did have one unscheduled dismount, and I did not, so I am the official Mackenzie Family Segway Champion! Can you believe it? Susun used to live in Santa Cruz and studied hula with the same instructor as Dana! We went down to say hello and she recognized him immediately. Wow, universe, sometimes you really know what you are doing. She told Dana about a drop-in hula class the next night that was in the kahiko (traditional) style. Even though it was our anniversary, I urged Dana to go, because it was a once-in-a-lifetime opportunity and you should have seen the way his eyes lit up. I skipped the four hours in the car and stayed home with Lilly. :) After all, number one on my agenda for our trip was to relax. We each had a fantastic time. 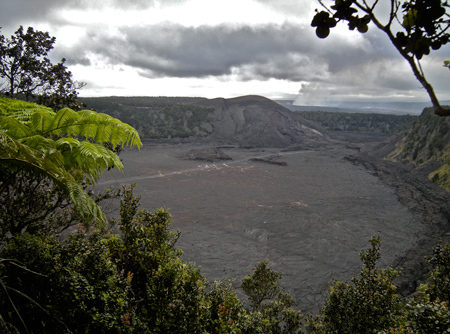 Our last day, we visited the active volcano at Kilauea. They say that at night you can see the glow from the molten lava, but we were flying out that evening so had to settle for a daytime visit. 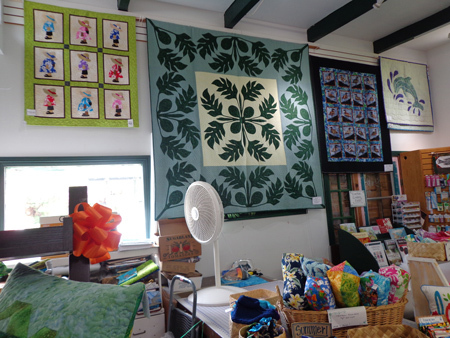 I sought out the nearby quilt shop, Kilauea Kreations. A quaint little shop that felt just like home to a quilter. 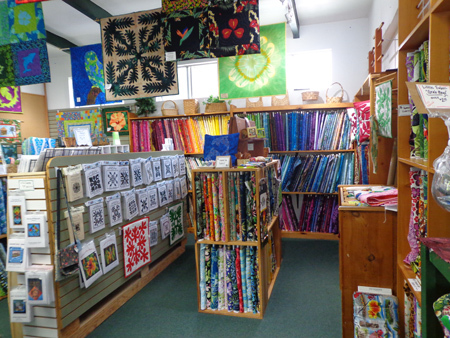 Many gorgeous fabrics, quilts, kits, and patterns, and also a little bookshop that Dana enjoyed. Check out Sunbonnet Sue and Overall Sam, Island Style. 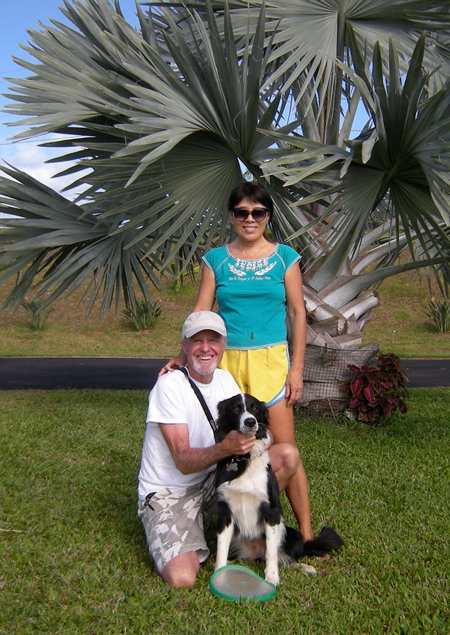 And then it was aloha to Lilly and our other hosts, Bob and Cady, and off to the airport for the long trip home. 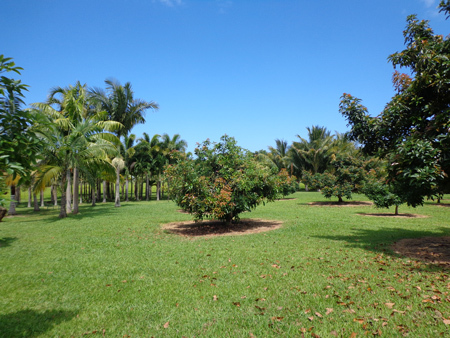 In case you’re interested, the Sun and Moon Orchard Suite is Listing #512344 on VRBO. Are you gearing up to become stuffed full of turkey or the diet-appropriate alternative choice? 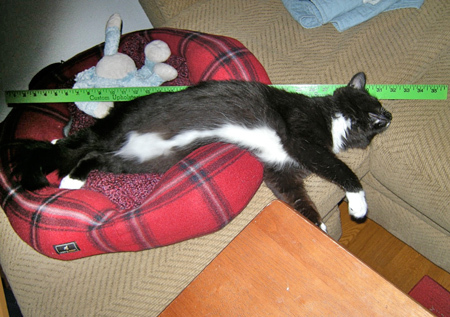 Hope you’re not too comatose to shop this weekend… Martingale’s having a fantastic sale. Wow! 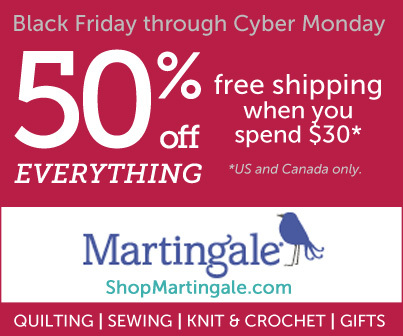 50% off of anything and everything! It’s a great opportunity to stock up on stocking stuffers and any of their titles that you’ve been eyeing for yourself. A little bird told me that although the graphic says Friday through Monday, the sale will also run all of Thursday, just in case if you need a break from cooking (or eating). Have a great holiday! 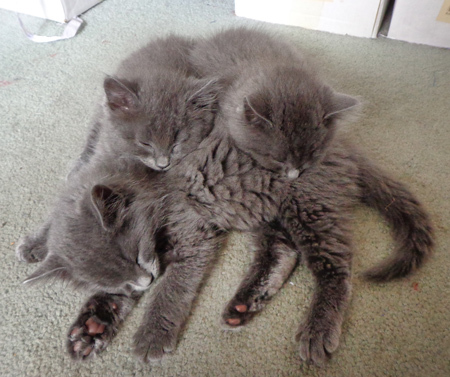 Here it’s me, Dana, Max, and three gray foster fuzzybritches. 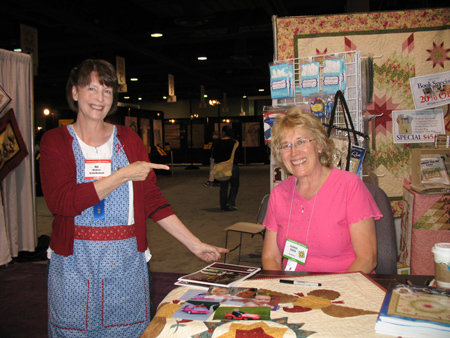 Cheryl Almgren Taylor, whom we’ve met before on the blog as the author of Deck the Halls and Inspirational Appliqué, dropped me a note to let me know that there’s still room in her classes at the upcoming International Quilt Festival in Long Beach, July 27-19, 2012. • “It Takes a Village,” where students learn how to construct a variety of houses and buildings for different projects using a basic template and fusible-web techniques. • “Wrapped Up in Ribbons,” where you’ll create a Happy Birthday table runner using easy piecing and basic fusible-web applique. It’s quick and easy and great for beginners. • A pictorial applique class using a fusible-web technique Cheryl calls ‘jigsaw applique.’ The class is called “Inspirational Applique: Psalm 100:3” and students will make a small pastoral wall hanging with sheep. The project appears in her Inpirational Applique book. There’s currently room in all three but hurry because registration can fill up fast! 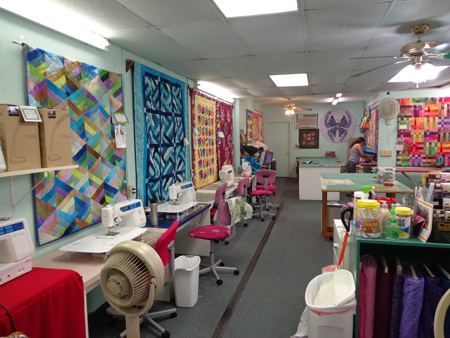 You can find out more information about Festival and register for classes at the Quilts.com website. And, how about a cruise this fall? 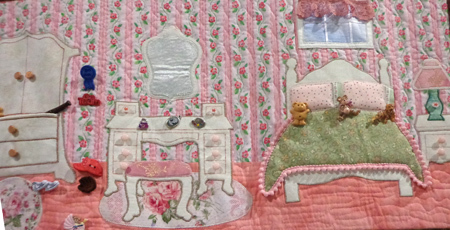 Cheryl will be teaching on a quilting, appliqué, and thread-painting cruise along with Nancy Prince and Chris Eichner from October 4-12, 2012. The Royal Caribbean ship leaves out of Baltimore and cruises up the Atlantic coastline, stopping at Portland and Bar Harbor, and on to St. John’s and Halifax, Nova Scotia. There will be three classes available, plus a bus trip to Keepsake Quilting and all the other sights of a fall foliage cruise. Full information on the cruise is available at SeaCruises.com. I’m off to Newark, California, tomorrow to set up for the Piecemaker’s Guild show this weekend. I finally found a way to code the blog so that the comments on each post are numbered. Finally I don’t have to manually count (and count again to be sure) to find the winning comment. Yay! 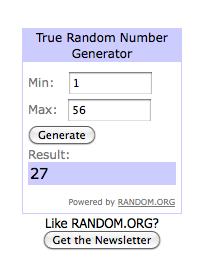 The winner of Nancy Mahoney’s Fast, Fusible Flower Quilts is… drumroll… Number 27, Susan! Susan says she is thrilled, being a big fan of Nancy’s work. I know she will enjoy the book. I felt like I was in Mood! A huge building full to the rafters with every type of material and trim you can think of. I meandered around and looked at everything, and finally found the cottons section. 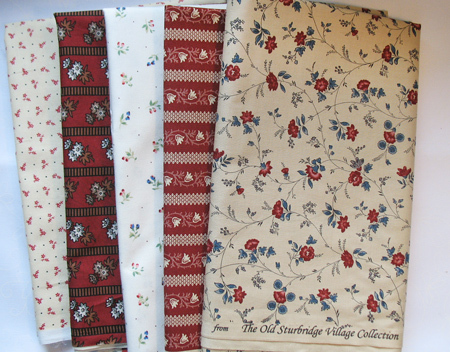 After some sleuthing I did discover some very good bolts of high-quality quilter’s cottons. Then I went to Windy Moon. A delightful visit as always, with gorgeous arrays of fabrics. It was a special treat to spy my Teapots 2 to Appliqué in one of their displays! 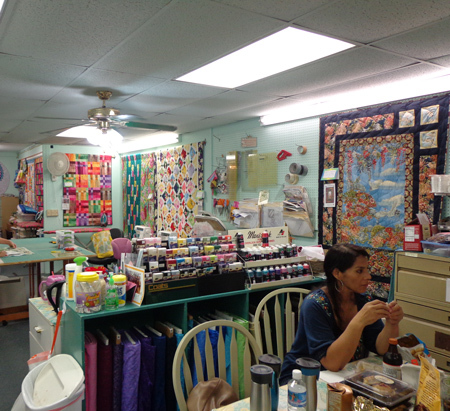 The next day I revisited Sew-n-Such, an airy, happy, cheerful quilt shop. It was just a fresh and friendly as the first time. Here are my fabric purchases from the trip. I was apparently on a deep-red-and-cream jag. Admin note: Early last week our ISP moved all of our websites and blogs to a new server, and upgraded the blogs to the latest version of WordPress. This was not without a fair amount of angst. By now, most of the wrinkles have been smoothed out, but if you notice anything funky about the blog (such as missing images), please let me know. As you may recall, I was in Palm Springs a couple weeks ago. 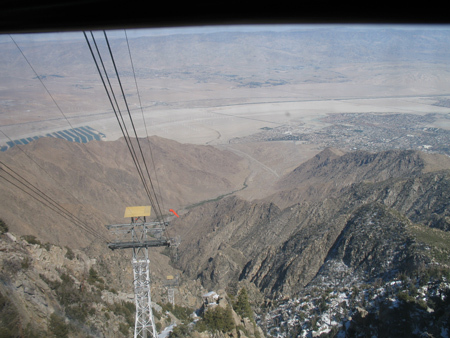 I had some time the morning of my arrival so I went up on the Palm Springs Aerial Tramway. Yeah. The climate goes from tropic Mexico at the bottom to arctic Canada at the top. And the wind was blowing. Yes, I am a weather wimp. Here’s where you get off at the top. 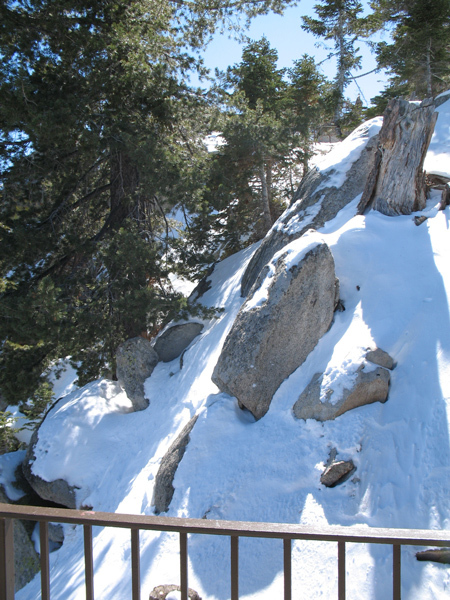 Just a tiny portion of the vast rugged mountain terrain. In this shot you can see the reflection of my plaid shirt in the window as I photographed from the comfort of an unoccupied dining hall. Here we are going down. 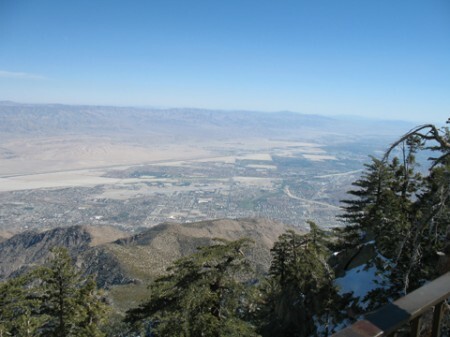 You can see Palm Springs spread out at the bottom. There are five towers and it was quite the engineering feat. The revolving tram cars are the only ones like them in the western hemisphere! If you ever get the chance, this is a very inspiring thing to do. The show was loads of fun. 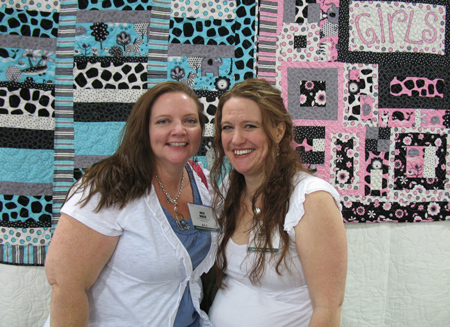 It took place on Friday/Saturday, and the next day I headed over to The Quilter’s Faire in nearby Palm Desert. The proprietress, my pal Debby, had been running a teapot challenge, and it was Awards Day! The shop went all-out. The DH Rob hung the challenge quilts from the rafters, and a lovely tea service was set out complete with scones, clotted cream, and lemon curd. 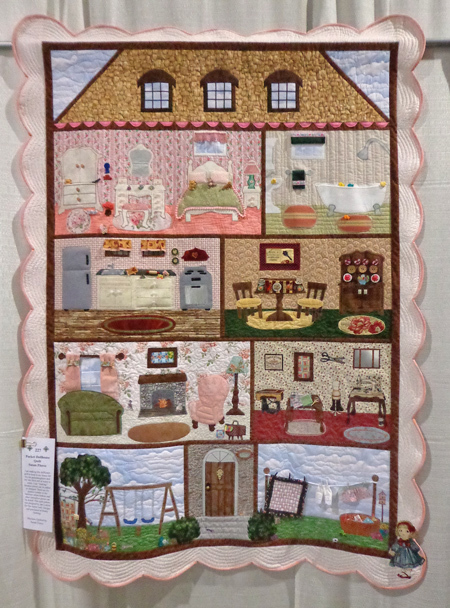 Please go to the the Quilter’s Faire blog to see photos of the Viewers’ Choice winner, my second-place winner, Designer’s Choice, and the lovely ladies who participated in the challenge. The story is spread out over several posts, so keep scrolling down! Next stop: The 33rd Annual Glendale Quilt Show. 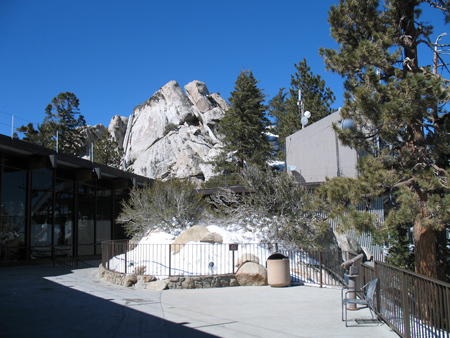 The show, held at the Burbank Airport Marriott Convention Center, is Friday through Sunday, March 16-18. What a great couple of weeks! What a great week I had. Not only did Quiltmaker feature my Petal Path in an alternate colorway on their Quilty Pleasures blog, my home guild had its annual quilt show! It was a blast and a half, seeing old friends and making new ones. AND on top of those two wonderful things, All About Appliqué was featured in a Best of the Web post on the Craft Corners blog!! Thank you so much! In other news, I came across this announcement of an upcoming appliqué retreat in Texas, Appliqué Away on Galveston Bay. Sounds like great fun. 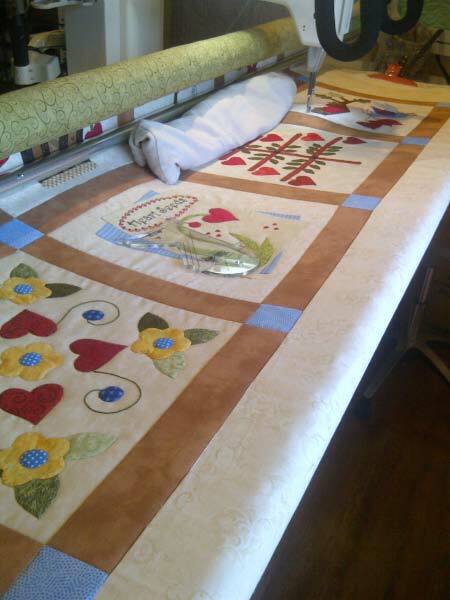 I’m on the road again tomorrow, headed toward Palm Springs for the Desert Guilds Quilt Show, March 2-3. If you’re out that way, I hope to see you at the show! Full information is at desertguildsquiltshow.com. It’s a Friday-Saturday show, and on Sunday, March 4, my pal Debby is hosting a special tea party event at her quilt shop The Quilter’s Faire in nearby Palm Desert. I’ll be there 11-2 ish, and I can’t wait to see what the Debby’s BOM gals have done! It’s a teapot challenge, and I get to present a special “Designer’s Choice” award. How fun. Then, on the way home, I get to see Cathy, always a super-special treat. Lastly, you’ve heard of the Five-Dollar Foot-Long? 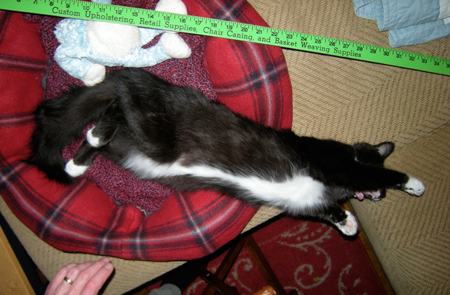 How about the Five-Month-Old Yard-Long? 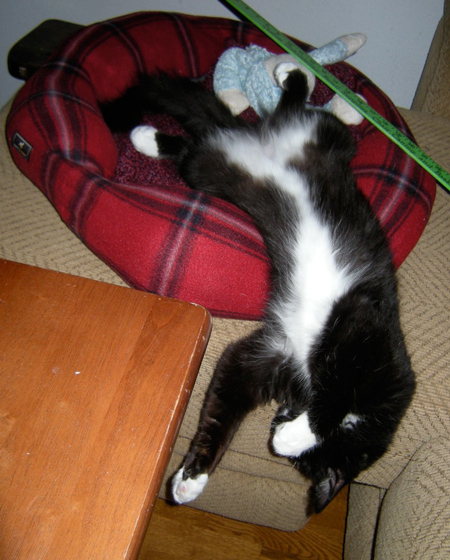 The Force of Grabbity is strong on a floppy cat. See you next week with a feature on a fantastic appliqué book! I just posted the most heartwarming story over on my Show & Tell Center. Please go see the post about Hearts of Joy. Do you know who these good-looking gentlemen are? On the left that’s Orion Burns, son of the illustrious Eleanor Burns. On the right that’s Chris Burns, Orion’s half-brother-from-another-mother. 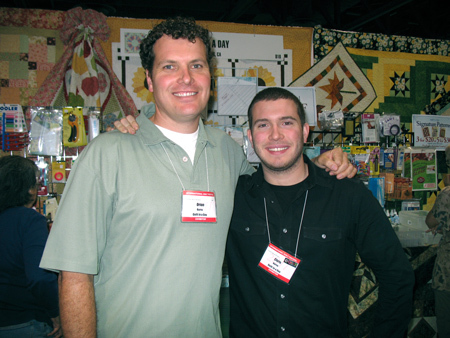 Both of them are instrumental in running Eleanor’s Quilt in a Day store in San Marcos, California. These guys are a hoot! Both just as friendly as can be, as cool as cucumbers, 100% knowledgeable about quilting products, and comfortable (to say the least) around the ladies. They kept me entertained all weekend. They let me take their picture once I promised to say how smart and handsome they both are. I was right across the aisle from Eleanor this time at Festival-Long Beach. Rubbing elbows with a quilting luminary. At one point Eleanor came over and asked if I had an extra plug so she could charge up her phone. At first I didn’t think so, but then I realized that the extension cord for my cash register had a couple extra outlets on it, so we plugged it in. Awhile later it rang. Eleanor was surrounded by her adoring public, and for a wild second I thought of picking it up and saying, “Eleanor Burns’s phone,” or “Joe’s bar, Joe ain’t here,” or something equally clever, but I was too chicken so I let it go to voicemail LOL. After that, Orion came hustling over, handed me his cell phone, asked me to tell his wife how to get there, and fled back to their busy cash register. Thanks goodness I used to live in the area a long time ago! I directed her as best as I could. I think she still managed to go the wrong way on the 710. After a couple more calls and helpful passersby, she finally arrived with the baby. I had such a great time this year! 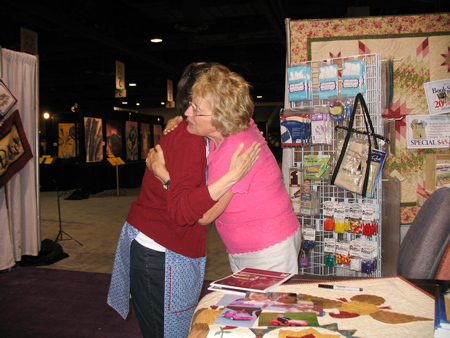 I felt that the energy and spirit in the quilting world was really up. And I enjoyed my neighbors very much. Eleanor gave me a hug and made me promise to tell the cell-phone-charging story. Back soon with a very cool book from the Lizzie B gals! The trip to Salt Lake City for Spring Quilt Market went “like butter.” I had a blast and a half. The good times started just as soon as the plane out of San Jose finished loading. My seat neighbor turned out to be going where I was going, so naturally we chattered like magpies the whole flight. 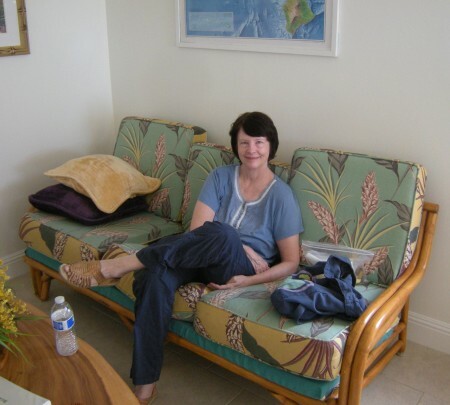 And get this… Julie said her friend Sally, who was picking her up at the airport, would give me a ride to my hotel too! How’s that for nice? No Supershuttling! They even picked me up and took me back to the airport for the flight home! These are the sweet gals who adopted me. Julie, left, and Sally, right. Sally Keller’s shop is Sally’s Angelworks, offering darling mini art quilts, unique fabric camera-strap covers, and other handmade items. Julie and Sally were there to shop, of course, and also to help out Amanda Herring at the Quilted Fish booth. All of them are part of the Riley Blake design team. Whew, these young quilter gals! Enough energy to power Salt Lake City for a week! Both of them have nice Market photos and stories on their blogs. Thursday was Schoolhouse, which is a series of short break-out sessions geared toward the shop owner, to introduce what’s new and exciting. This is how it works. Two hours before the whole deal starts, you can get the schedule. There was a huge room full of chairs where you could sit and study the offerings, plotting and scheming on which ones you wanted to go to. There were about 20 sessions in each time slot, so if there were two at once you liked, you had to pick the one you wanted most! When each session ended, it was that silly thing that happens when elevator doors open… people wanting to get out and people wanting to get in at the same time. There were thousands of bodies, everybody had wheelie bags, and it was one great big milling churn dash. I’ll share the first couple sessions that I went to, and I’ll put up more information later, in bites. First on the docket I chose to go hear Dan Purcell. Dan is the boy genius son of Bob and Heather Purcell of Superior Threads. Dan, a smartywhistle techie extraordinaire, grew up in the quilting industry and is the nicest, friendliest young guy you would ever want to meet. 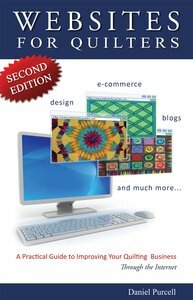 Dan operates Websites for Quilters, a company offering a whole bunch of services for quilters who want to be on the web and need a little or a lot of help. One of the great things that Dan told us about is his FindMyFabric.com, a fabric, quilting, and sewing supply search engine. You can search for products offered by hundreds of online stores to find exactly what you are looking for. You can also search by uploading a photo of the fabric you need more of! How cool is that?? And totally free, this one. Dan also operates QuilterBlogs.com, a directory of quilting blogs that you can check out to see what’s out there in the blogosphere. I bought Dan’s book so I can learn more valuable nuggets about having a quilting website. Next I went to the presentation by Stacey Michell of Shades Textiles. 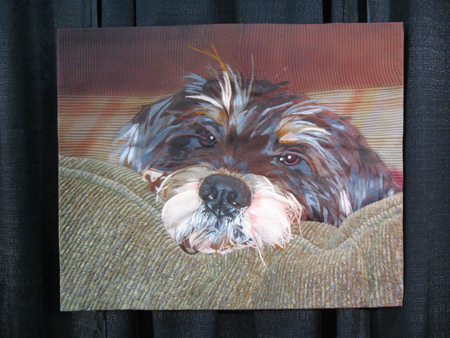 Stacey’s main product is SoftFuse, a paper-backed fusible web that has become my favorite. It’s the lightest weight, and it actually works the way this type of product is supposed to work! What a concept! It fuses quickly, the paper comes off right away, and like I said it is extremely lightweight and flexible. Stacey’s mom is Marti Michell. They were both there at the session to show us how you can use the product to do a prepared-edge type of appliqué for either hand or machine stitching. It’s fused, and the edges are turned! Very interesting! I’ll be giving this a try myself and will report the results here on the blog. I ordered some SoftFuse so I’ll be able to offer it on my website soon. This was my favorite entry in the quilt display. I’m Watching You by Barbara McKie of Old Lyme, Connecticut. I was in Sacramento for three days for the Quilt, Craft, & Sewing Festival. I had so much animal company! The show was at Cal Expo, a great big huge events and State Fair grounds. As soon as I got there I knew there had to be some horses around and I was craning my neck for stables or any other sign of equine presence. The next morning I saw the harness racers breezing around the track! 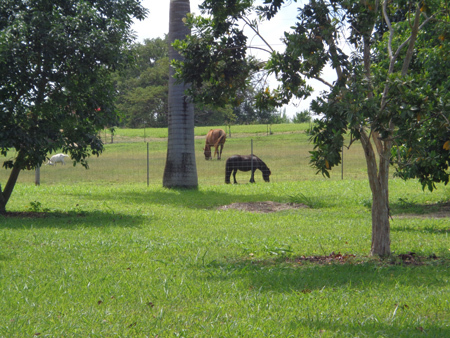 This one had his stablemate along for the jog. Either that or they were both warming up, I don’t know, but when I was a kid I read every Black Stallion book there was and sometimes the horses had friends. 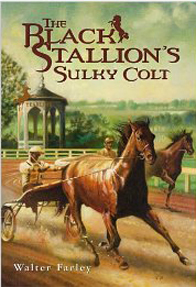 I kept thinking about The Black Stallion’s Sulky Colt and it really took me back to childhood. Now bear with me, I’m gonna get this to tie into quilting. My first quilt teacher used to say, “A man on a fast horse would think it looked pretty good.” Now these men weren’t exactly on the horse, but they would still think that all of our quilts looked great! As soon as you came in the door to the show you were treated to this sight. 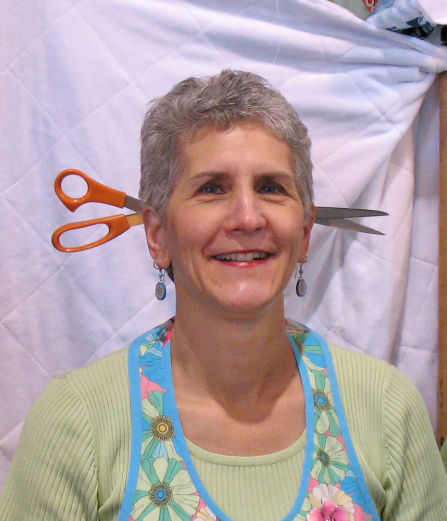 That’s Rochelle herself from Rochelle’s Fine Fabric and Quilting, who came all the way from Port Orchard, Washington, with scissors in her head. And she didn’t even have a headache. What a gal. 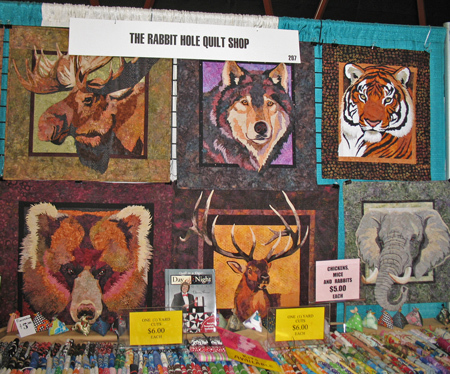 My booth was directly across from The Rabbit Hole Quilt Shop from Chico, California. They had a trunk show from the Big Fork Bay Cotton Company. Look at all these splendid animals that kept me company during the show! Little Sacramento dogs get to go with their humans lots of places. 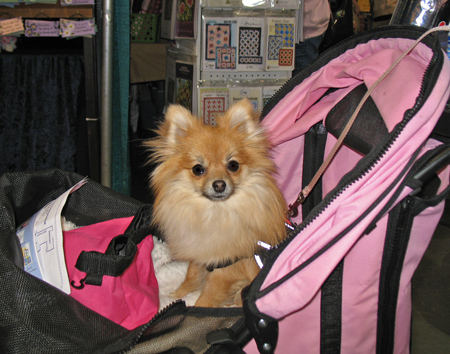 During the show, I saw a cockapoo in a European shoulder bag, a Yorkie in a sling, a poodle in a purse, but the only one I got a picture of was the pom in a pram. It started last Wednesday morning bright and early as Dana and I packed the car and drove an hour and a half to Pleasant Hill, California, to attend the quarterly meeting of the Northern California Quilt Council. I had been invited to participate in a panel discussion called “So You Want to Get it Published.” How very cool! Publishing nerd that I am, I can’t think of a more thrilling topic. My fellow panel members were Cara Gulati of Doodle Press, Jill Rixman of A Designing Woman, Megan Wisniewski and Lynn Koolish of C&T Publishing, authors Judy Sisneros and Melinda Bula, Tracey Brookshier of Brookshier Design Studio, and Judy Mullen of Scaredy Cat Designs. 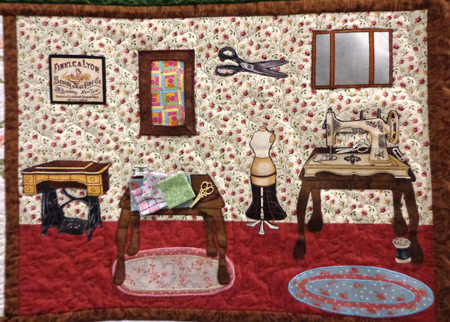 Quite an array of different perspectives on publishing in the quilting world! We each had five minutes to introduce ourselves, complete with red, yellow, and green flash cards to let us know when the hook was approaching LOL. Questions from the floor followed. Some of the answers shared great information about various forms of ‘getting it published,’ while others provided moving inspiration. I think we all wish the session could have gone on longer. We only scratched the surface; there was so much more to talk about! After the meeting was over Dana and I had lunch and set off for our next destination: Shinneyboo Creek Cabins near Emigrant Gap in the Sierra Nevadas. This is a rustic vacation resort with little cabins that I found by following Google Maps up I-80. Little cabin in the woods. We brought our dinner and warmed it up in our cozy little cabin in the microwave, and made tea with the electric kettle. Dana immediately climbed up into the loft and turned 10 years old again, reading in the loft as happy as a clam. I read some quilting magazines and stitched three holly leaves. The next morning we went for a walk. (Notice I said walk. I’m a good sturdy walker but don’t say the word hike.) 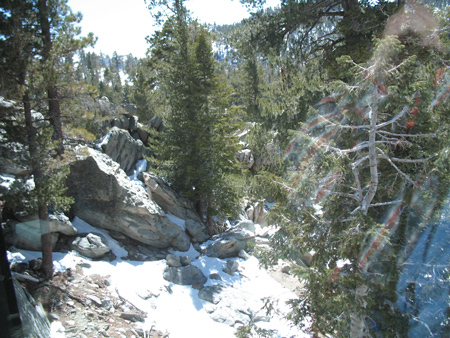 Our destination was the Pierce Creek Wetlands Trail, ¼ mile from the path behind our cabin. A mile or so later down a rocky road, we came to the following sign. I swear they were in that order. But we did find the Pierce Wetlands, er, dry creekbed. Rains this winter will undoubtedly make it wet again. They also have a yurt. Dana examining a fascinating rock. Dana contemplating a sign that says nothing, with a pine cone on his head. Don't ask. We left Shinneyboo and drove east to Bearpaws & Hollyhocks, a charming quilt shop in Sacramento well worth the detour. I found some of the double pinks that I have come to greatly appreciate. As I was perusing the shop’s lovely fabrics and making my selections, the owner came in. “Oh, hello!” she said to me. She had been at the NCQC meeting that morning! It was great to chat with Patti a little bit about the experience. 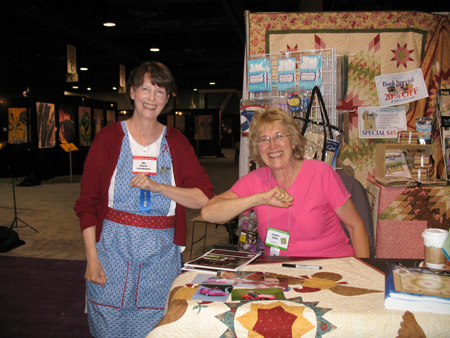 She gave me a copy of the 2007 Quilt Sampler magazine, which features Cabin Fever as one of the Top Ten Stores! Congratulations Patti and staff! Just one part of the store. Then, on to our last stop, the Sands Regency in Reno, Nevada. Dana plays in a chess tournament at the Sands once or twice a year and I love to go along when I can. The fabulous Windy Moon Quilts has a huge selection of fabrics, lots of lights and darks and other categories too numerous to mention. I also found Sew-n-Such, a very fun shop featuring sewing machines, sergers, and a sizeable quilt fabric presence. Very nice vibe in that shop. My haul of fabrics from the trip. Can you tell that I’m collecting backgrounds, reds, pinks, greens, and blues? Yep, I’m off to the races on another future project. So what quilter doesn’t combine vacation time with visits to quilt shops, catching up on quilting magazines, and time spent on take-along projects? For us, all trips are quasi-quilty! I sure enjoyed mine. As I’ve written before, Dana and I had our 20th wedding anniversary on May 19 and we decided to go to Hawaii as our special celebration. The Starwood people sent us an offer for a cheep package at one of their 5-star resorts on Kauai, which is where we wanted to go anyway, so it was kismet! 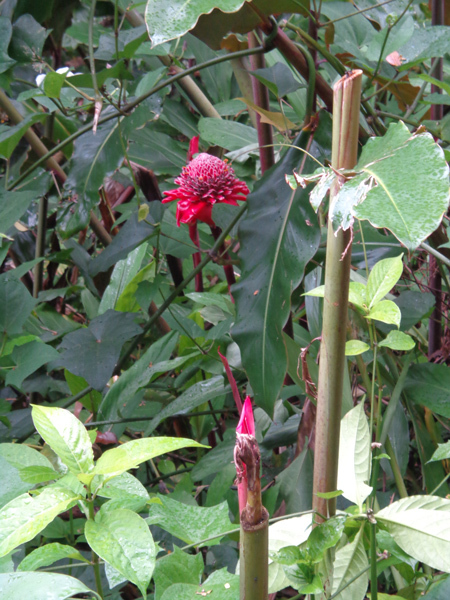 One of the first places we went was Limahuli Botanical Gardens, not far away on the North Shore. Taro (kalo in Hawaiian). 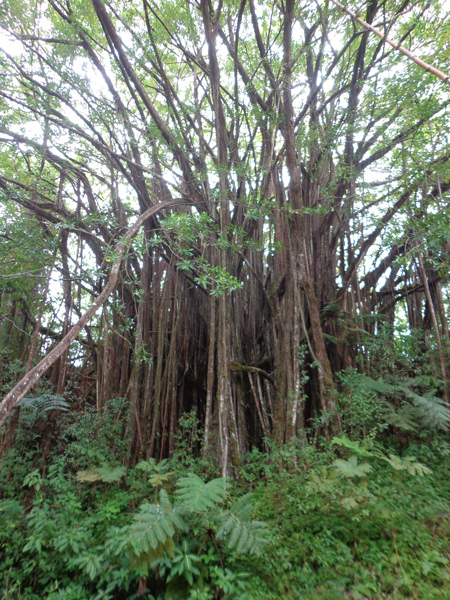 The roots are the main starch of the traditional Hawaiian diet and the source of that poi. Dana in some hala trees. Pineapples grow on the ground, not in trees. A most special and beautiful spot on the island was Hanalei Bay. You remember Puff the Magic Dragon, who frolicked in the autumn mists in a land called Hanalee? Well, there’s no proof that Hanalee is really Hanalei, but Hanalei has claimed Puff. In fact we heard someone say that the best sunsets are when the sun goes down behind Puff’s nose in the bay, so of course we had to see if we could make out a dragon in the cliffs. We think we can. Here’s Dana practicing his hula on the beach at Hanalei, in front of Puff. Picture it as a dragon’s head, with his lower jaw submerged in the water. You can see the top of his head, and there’s a bare patch that looks like his eye, and then the snout goes off into the ocean. We visited the Kilauea Lighthouse, an old lighthouse in need of restoration. Today the area is a preserve for marine birdlife and we saw many different kinds of sea birds as well as some spectacular coastal views. Looking left from the lighthouse, back toward Princeville. In a nearby shop I found a Jack Russell terrier who’d never met a stranger. Everywhere on the Kauai lowlands, and I mean everywhere, you see these chickens. According to my bird book, they’re “Red Junglefowl.” Here’s a typical fancy rooster with his plainer lady friend. Zipline! So much fun! 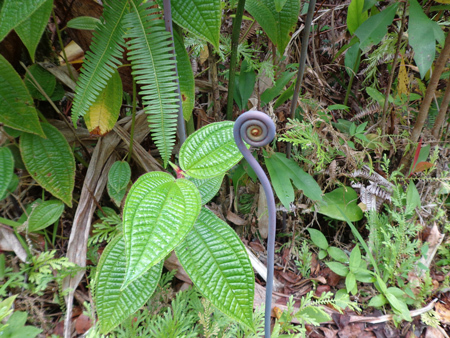 We took the Kauai Backcountry Adventures zipline tour and loved every minute of it. Me on the zipline. The guide said I had the most relaxed posture of anyone in the group. Dana zipping along. His posture was likened to that of a cat about to be put in the sink for a bath. I think the red shorts and white socks really add to the effect. Of course when you’re in Hawaii you can’t miss going to a luau. On the recommendation of some friends, we chose the Smith Family Garden Luau. One of the great things about this luau (besides the plentiful mai tais, the delicious feast, and the multinational show) is that you get to a take a tram tour of their lovely gardens. There were gobs of tame peacocks who, I swear, loved to show off their plumage for the visitors. You can’t miss the aloha shirt on the wall outside the Waimea Canyon General Store in Kekaha, just before you start up the road alongside Waimea Canyon. It’s a size 28XL. Waimea Cayon, from not very far up. 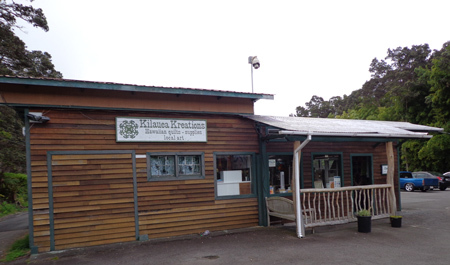 And now the stop that you’ve been waiting for… the Kapaia Stitchery! Not one step inside the front door, I saw Tracey‘s Bento Box hanging up. Happy Hula Huts by Lisa Boyer, a Kauai resident. Another of Lisa’s patterns, Keiki Hula. They have tons of batiks. Lei. Check out the one made out of yoyos! 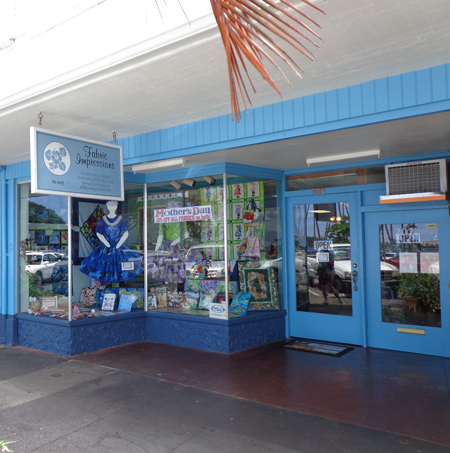 As you can see, it’s a fabulous shop, very friendly, and of course you must go there when you visit Kauai. 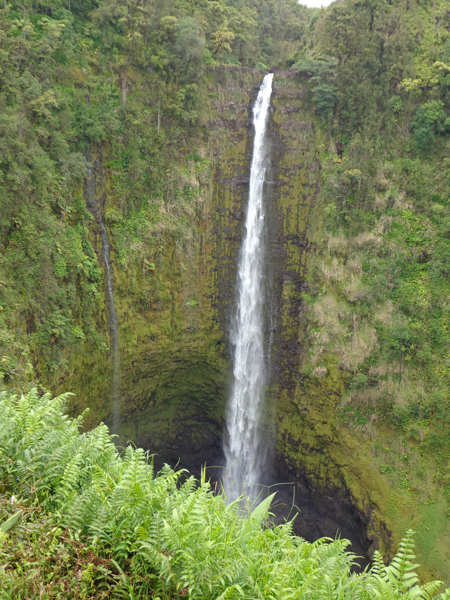 Right next to the Stitchery is the turnoff for Wailua Falls. About 4 miles up the road all of a sudden you’re beside a beautiful rushing waterfall. 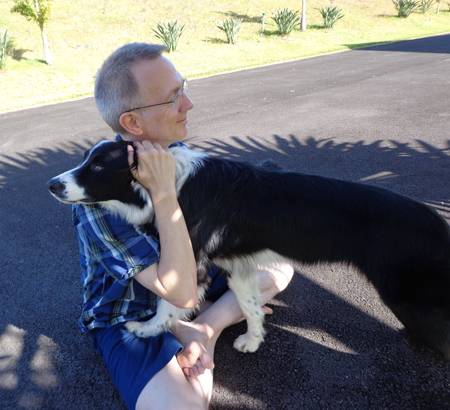 Thanks for coming with me on my tour of Kauai.